You can now get the most precious spice in the world for a fair price at our store. Made from different types of saffron coupe threads. 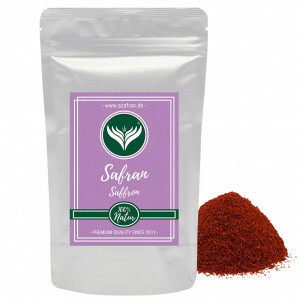 Our saffron powder comes in aroma bags with 50 grams. Our saffron is so potent that it has a colour value of over 200 according to ISO 3632-2, which places it in the top category for saffron. Experts always compliment saffron that has a rich colour like this Persian coupe saffron and the unique flavour of our powder. These spices are perfect for Mediterranean and Asian cuisine recipes because of their light, fragrant properties. The saffron analysis conducted for our Persian coupe powder showed that according to ISO 3632-2 (2015/2016), the colour of our saffron is rated at 245 (crocin), the fragrance at 29,75 (safranal) and taste at 91,5 (picrocrocin). It's an incredible value if you are looking for delicious saffron at the lowest prices. Saffron is one of the most scintillating spices to taste, but it should not be consumed in large quantities. Pregnant women should also take care when digesting saffron to alleviate mood swings. You should always check with your medical doctor before taking saffron for health purposes.